I found myself with a pocket of free time a few weeks ago and I decided to take on a little baking project. If you can believe it, I clipped this recipe from an issue of Cooking Light about 5 years ago and I finally got around to making it. These little rolls were pretty good and fun to make. They didn’t rise as much as I thought they would, but the yeast I used was a little old, so that might have been the reason. I’m not an expert baker by any means, but when I’m in the mood, I do enjoy it. For this recipe, the first step is to mix up the dough, turn it out onto a floured work surface, and knead for about 8 minutes until it is smooth and elastic. Then, you let it rise for about 1 hour. 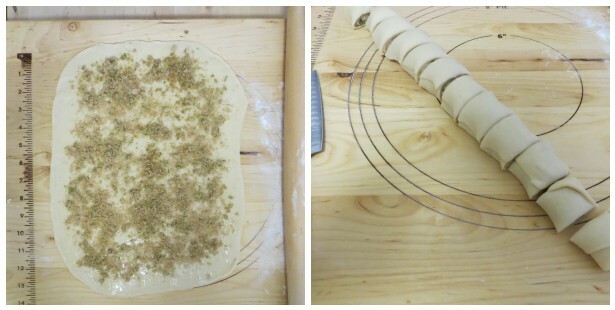 When it is ready, cut the dough into two pieces and roll each one out into a 12 x 10 inch rectangle. Sprinkle on the filling (a mixture of brown sugar, cardamom, and lime zest). Then, roll up and cut into small pieces. sprinkle the filling + roll it up! It’s all pretty easy enough. 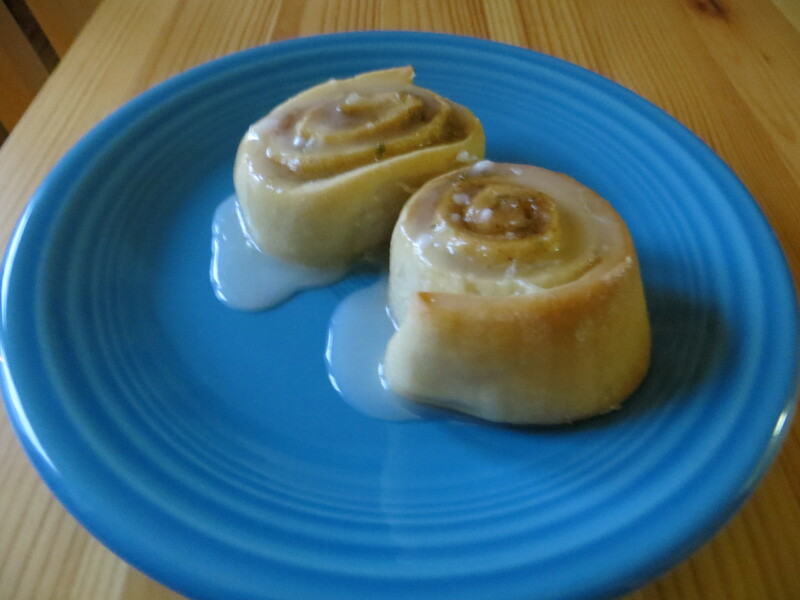 As soon as the rolls came out of the oven, I mixed up the glaze to drizzle on while they were still warm. In the end, I felt that they were a little on the sweet side for me, so I think I would use less of the glaze topping next time. 1. To make the dough, dissolve yeast in warm water in a small bowl and let it stand for 5 minutes. Meanwhile, combine sour cream and next five ingredients (through egg) in bowl. Stir until well blended. Gradually stir yeast mixture into sour cream mixture. 2. Add 2 cups flour to the sour cream mixture, stirring just enough to create a soft dough. 3. 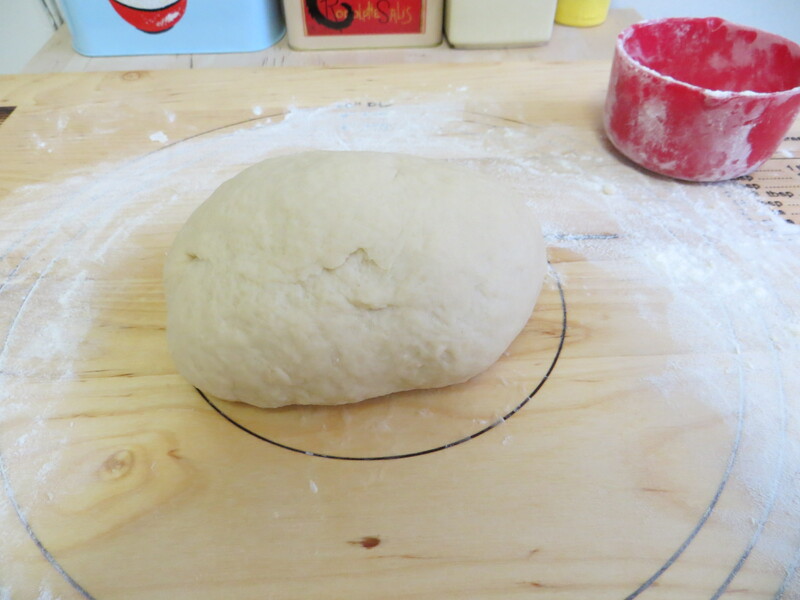 Turn dough out onto floured work surface and knead until smooth and elastic (about 8 minutes). While kneading, add remaining amount of flour, a little at a time. 4. Place dough in large bowl coated with cooking spray (turning it over to coat). Cover with a clean kitchen towel and let sit for about an hour. The recipe indicates it should double in size. Mine did not, but it did rise a little. 5. Mix the filling in a small bowl: combine brown sugar, cardamom and lime zest. Set aside. 6. When the dough has risen enough, divide it in half. Working with one half at a time, roll it out on a floured surface (keep your rolling pin lightly floured too!) into a 12 x 10 rectangle. Sprinkle with half of the filling mixture. Then, roll it up jelly-roll style, beginning with the long end. Cut into about 12 1-inch slices. 7. Place the slices cut-side up in a baking dish that’s been sprayed with cooking spray. Cover with another clean kitchen towel and let rest/rise for about 30 minutes. 8. When ready, bake rolls for about 25 minutes at 350 degrees, until lightly browned. Let cool on cooling rack for about 5 minutes. While the rolls are cooling, mix up the glaze by combining powdered sugar with lime juice in a small bowl. 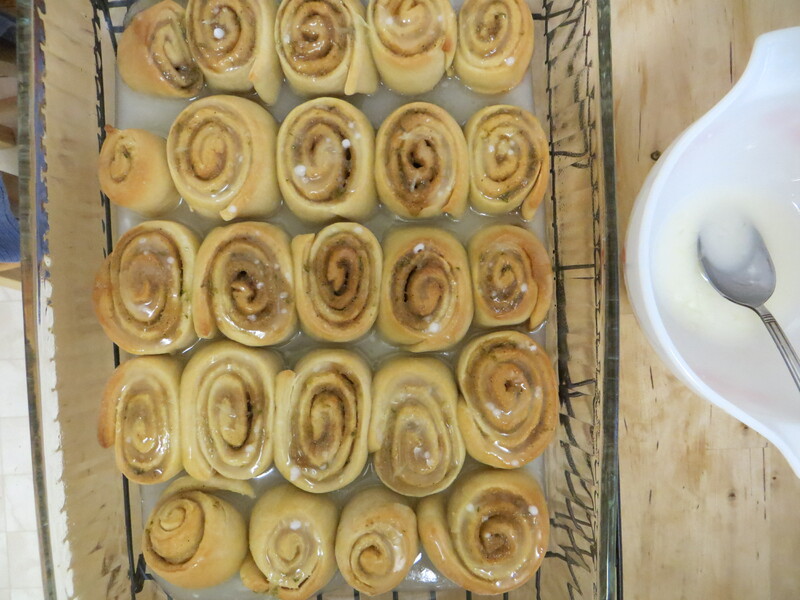 Drizzle glaze over warm rolls. Enjoy! Categories: Baking, breakfast, brunch, cardamom, limes, vegetarian | Tags: baking, breakfast baking, brunch ideas, cardamom, limes, sweet rolls, vegetarian | Permalink. 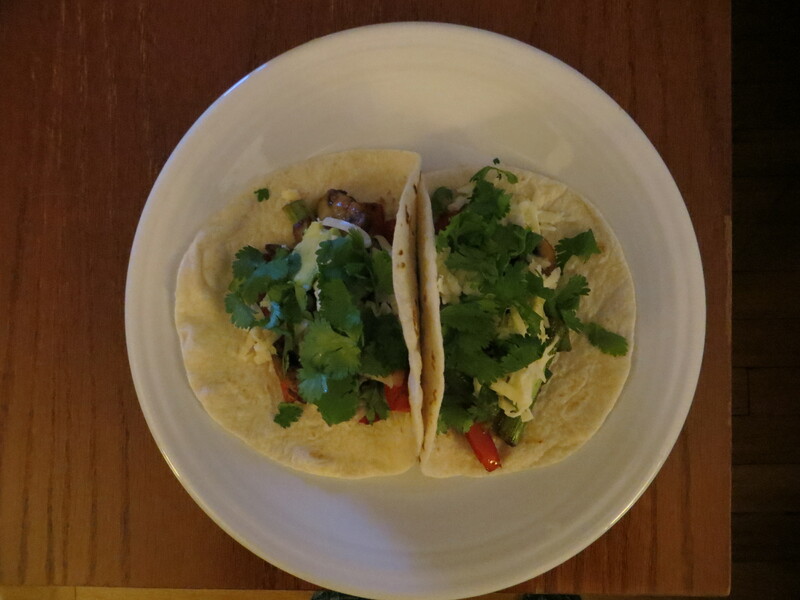 I make these veggie fajitas all the time for an easy, weeknight meal. It comes together really quickly, so get everything chopped and ready before you start. The mix of veggies is entirely up to you. One of my favorite combinations is carrots, mushrooms, red onions, and red peppers. This time I added asparagus and it was very good. Those little baby bella mushrooms would also be a good idea, along with maybe some poblano peppers? In my opinion, the carrots are a key addition, which might be surprising, but trust me on this. This isn’t really a recipe at all – more like a method. If you have any leftover cooked veggies, add them to quesadillas later in the week for a quick snack. Also, don’t omit the lime juice step. It really brightens up the flavors. 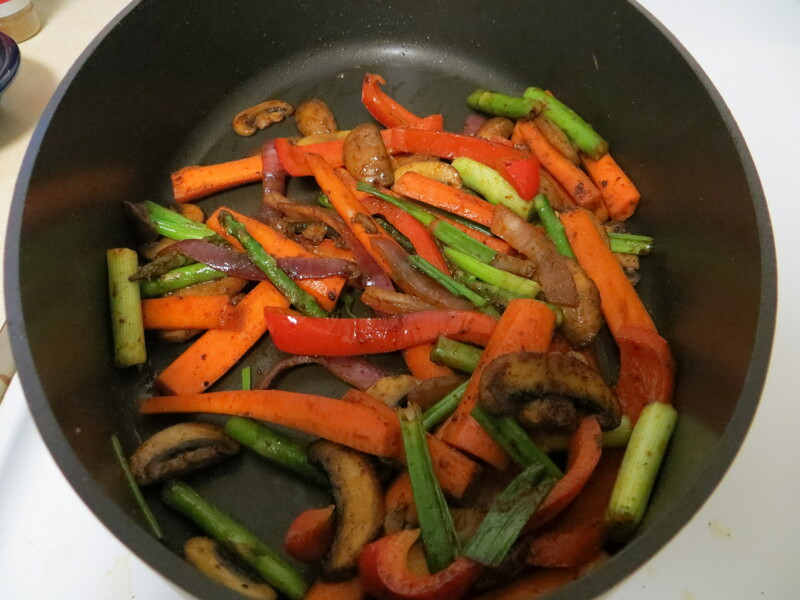 Whatever fresh veggies you’d like: carrots, peppers, mushrooms, zucchini, red onions, scallions, or asparagus. 1. Prep and cut your veggies. I cut the mushrooms into thick slices, and for everything else, I like to cut the veggies into long thin strips approximately the same size. 2. Add a little olive oil to a sauté pan and heat over medium-high heat. Add the veggies all at once and sauté. Cook until just softened (but not mushy). I like to keep things on the crunchy side. 3. Add the cumin, chili powder, and smoked paprika, plus some salt (to taste). Stir everything around so the spices coat all the veggies and cook for just a few minutes. Then, add some squeezes of fresh lime juice to the pan, stirring so all the veggies get dressed with the juice. 4. Assemble your fajitas and enjoy! Categories: easy, Mexican, vegan, vegetarian | Tags: easy weeknight meal, Mexican, vegan, vegetable fajitas, vegetarian | Permalink. Hello, readers! It has been a few weeks since the last post. I hope spring has sprung where you live. We’re still waiting on it in Chicago. I haven’t retired my winter coat yet for the season, and that is always my barometer around this time of year. I was thinking this morning that maybe, just maybe, I’ll put away the winter hats, gloves and scarves. But I don’t want to jinx it. Figuring out what to cook is tricky this time of year, isn’t it? My neighborhood farmer’s market is still many weeks away from opening for the season, and I can’t figure out what I’m in the mood to eat. A few weeks ago, we decided to make ourselves brunch one weekend morning. I can’t remember why we did it, but it was a great idea. Brunch at home is fun. For the main dish, we made a strata. My sister introduced me to this recipe (thanks, A!). She made it for Christmas morning a few years ago and it was a big hit. I’m typically not a fan of egg dishes, but this strata isn’t too egg-y, and of course, Gruyère cheese makes everything insanely good. It takes a bit of planning because you assemble the strata the night before. Then, you leave it in the refrigerator overnight, pressing it down with whatever you have handy. I used some cans and a bag of lentils. 1. Heat 2 tablespoons of butter in a skillet and sauté shallots about 3 minutes. Add spinach and salt and pepper (to taste). Cook for about 2 minutes. Transfer to a bowl and set aside. Pour the wine into the same skillet and simmer until reduced, for about 2 minutes. Set aside. 2. Butter an 8-inch square baking dish with remaining tablespoon of butter. Arrange half of the bread slices in a single layer in the dish. 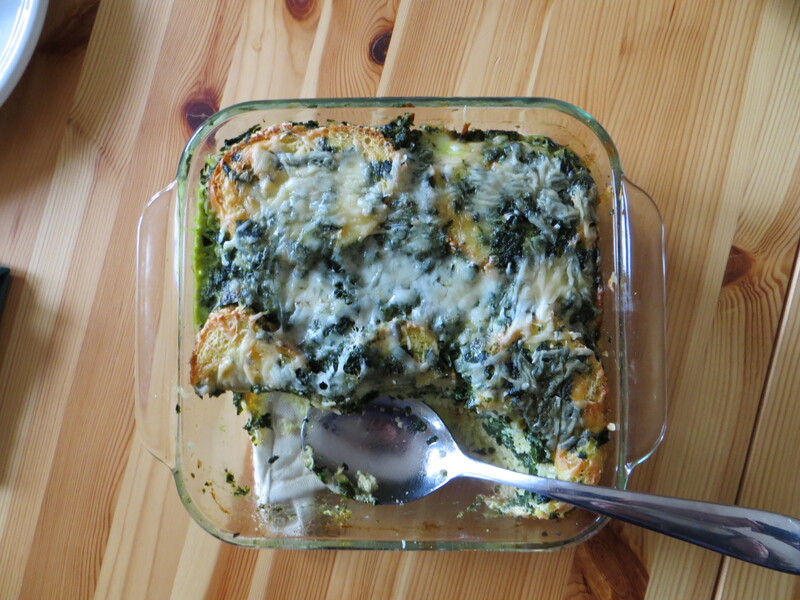 Sprinkle half of the spinach mixture, then ½ cup of the cheese over the bread. Arrange remaining bread slices in a single layer over the cheese, then sprinkle the rest of the spinach mixture and another ½ cup of cheese evenly over the bread. 3. In a medium bowl, whisk eggs together. Then, whisk in the wine, milk, and a scant 1 teaspoon salt and pepper (to taste). 4. Pour egg mixture evenly over the bread layers. Cover the surface flush with plastic wrap and weigh down. 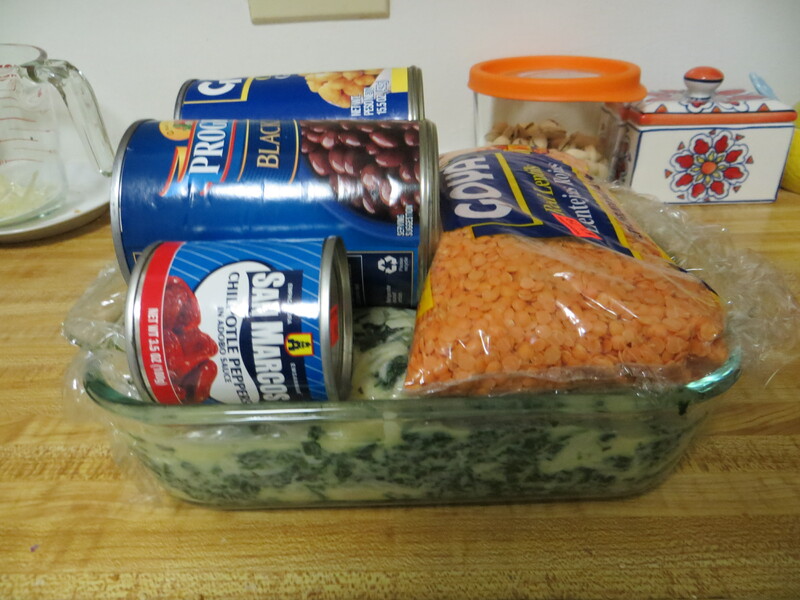 Use whatever you have handy in your kitchen to do this (I used cans and a bag of lentils). Refrigerate the strata overnight. The original recipe indicates that you could also refrigerate it for 1 hour, but I’ve always done it overnight. 5. The next morning (or at least 1 hour later), remove dish from refrigerator and let stand at room temperature for about 20 minutes. Uncover strata and top with remaining ½ cup shredded cheese. Bake at 325 degrees for about 50-55 minutes. It’s done when the edges and center are puffed and the edges have pulled away slightly from the sides of the dish. Cool for about 5 minutes, then enjoy! 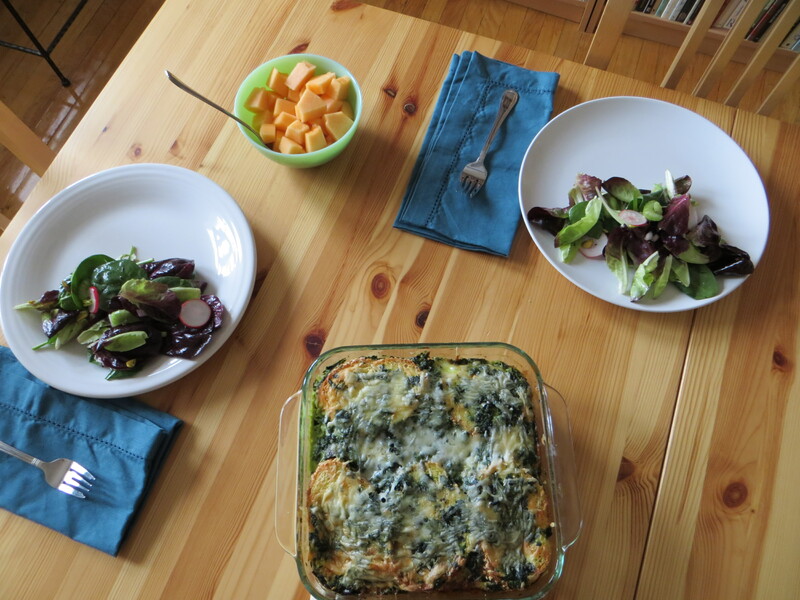 Categories: breakfast, brunch, cheese, eggs, gruyere, spinach, vegetarian | Tags: cheese, eggs, gruyere, spinach, spring brunch, strata, vegetarian | Permalink.